The SREDA region is conveniently located to reach the large markets of the West. Strategically, along Interstate 84 (east west), U.S. Highway 95 (north south), and U.S. Highways 20-26 (east west), the area is ideally positioned to the major transportation corridors in all four directions. 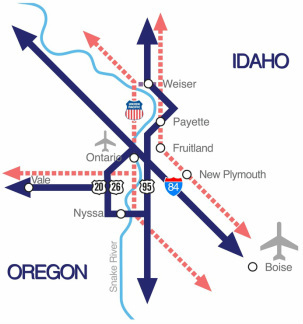 Air Service is provided by a General Aviation Regional Airport in Ontario, Oregon that is within a few minutes of travel time; two (2) general aviation public use airports, one in Payette, and another in Weiser, Idaho; and the Boise Idaho Airport with direct connections to International Flights is 50 minutes from the area. Nation Rail Service is provided by Union Pacific. Local service is provided by the short lines of Idaho Northern & Pacific Railroad in Idaho (parent company Rio Grand Pacific), and Oregon Eastern Railroad (parent company Wyoming & Colorado Railroad)..